Rahu and Ketu are dreaded as much malefic. Rahu and Ketu traverse through one sign for around eighteen months. Both move in retrograde mode. Viewing this, pattern set up by them becomes order of the day for long time. Things are to move at such a rapid pace that you do not have much time to ponder over a situation. 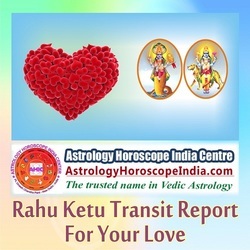 At the same time if transit of Rahu –Ketu is not favorable this can lead delay in finding soul mate. Transit of these planets over luminaries is normally considered as an event to take note of.